This course will be a fun and informative way to complete the WSET Level 1 qualification and will end with the exam. Starting at 9am with tea and coffee, we’ll stop for a delicious picnic lunch at around 1pm, resuming studies in the afternoon until 4pm. We will end the day with the exam which will be completed by 5pm. The WSET Level 1 Award is an internationally recognised course devised by the Wine and Spirit Education Trust. For individuals new to wine study, this qualification provides a hands-on introduction to the world of wine. 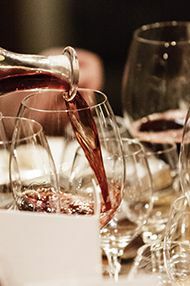 You’ll explore the main types and styles of wine through sight, smell and taste, looking at how to pair wine with food. A selection of wines will be tasted, offering a broad introduction. The examination (a 30-question multiple choice paper) is sat at the end of the day, to be completed within 45 minutes. Upon successful completion of the course you will receive a WSET certificate and lapel pin. Berry Bros. & Rudd's examination courses are devised by the Wine & Spirit Education Trust (WSET) and are formally and internationally recognised courses that are followed by those entering the wine and hospitality trades. These enjoyable courses are ideal also for those who seek official recognition of their achievements. Emphasis is on personal tuition and group discussion in our unique surroundings. As well as delicious picnic-style lunches, refreshments are served during the two sessions each day. The course ends with a celebratory glass of Champagne to toast your achievement. The course cost covers WSET examination fees, course materials, accredited tuition, use of our equipment and our tasting samples. Course materials and mock papers are sent to you two months before the course begins, so you can start your studies before classes commence.